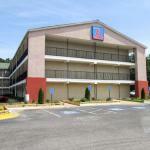 Located off 1-520 W Exit 2 Motel 6 Augusta - Ft Gordon is set in Belair 10 km from Augusta and 35 km from Aiken. Features include free WiFi and a cable TV in every room. Each room comes with a desk with a chair. All rooms are fitted with a private bathroom equipped with a bath or shower. You will find a 24-hour front desk at the property. Guests can also enjoy free parking on site and will have access to drink and snack vending machines. The property is 3.1 kilometres' drive from Augusta Mall and 4.9 kilometres' drive from August National Golf Club.